Vision depends on the eye Eyes are the body's camera. Eyes are an essential part of life for humans, and, as we all see. The vital function of the sun at the center of our solar system is to emit light and it's not an accident at any case. Light is what drives life. It's hard to imagine our world and life without it. The sensing of light by living things is almost universal. Plants use light through photosynthesis to grow, animals use light to hunt their prey or to sense and escape from predators and we humans are visual creatures. We may not see detail as well as an insect, but we see far better than most other mammals. Some say that it is the development of stereoscopic vision, along with the development of the large human brain and the freeing of hands from locomotion that have allowed humans to evolve to such a high level. In this theme, we'll discuss the amazing inner workings of the human eye! Without vision our world would be dark, finding our way around the world is much harder, and we would miss out on an immeasurable amount of beauty. 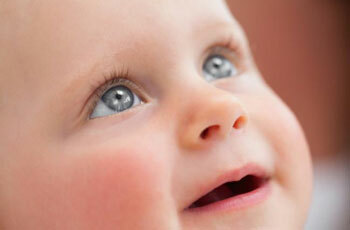 Eyes are an essential part of life for humans as we all see. The outer layer of the human eye It contains the sclera (the white of the eye) and the cornea (the clear dome at the front of the eye). The human eye has been called the most intricate and complex organ in our body. It's amazing that something so small can have so many working parts. But when you consider how difficult the task of providing vision really is, perhaps it's no wonder after all. Each of our eyeballs is an irregular sphere about 25 mm (1 in.) in diameter. The eye ball consists of three layers: The outer, middle and inner layers. 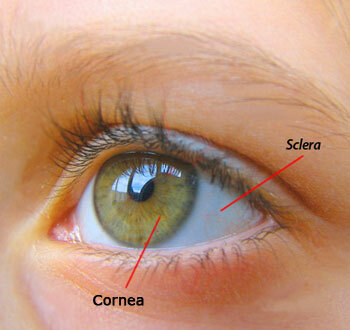 The outer layer: It is tough, fibrous covering with two obviously different regions: the sclera and the cornea. The sclera, often called the white of the eye, protects and shapes the eyeball and serves as an attachment site for the muscles that move the eye. In front and center of the eye, the transparent cornea bulges slightly outward and provides the window through which light enters the eye. As light passes through the curved surface of the cornea, it is bent toward the light-sensitive surface at the back of the eye. Unlike most tissues in the body, the cornea lacks blood vessels. Although the cornea has no blood supply, it does have pain receptors. Middle layer of the eye The middle layer of the eye has three distinct regions – the choroid, the ciliary body, and the iris. The middle layer of the eye has three distinct regions – the choroid, the ciliary body, and the iris. The choroid is a layer that contains many blood vessels that supply nutrients and oxygen to the tissues of the eye. The choroid layer also contains the brown pigment melanin, which absorbs light after it strikes the light-sensitive layer. This absorption of light helps prevent the reflection of light within the eye, resulting in sharper vision.The ciliary body is a ring of the tissue primarily muscle, that encircles the lens, holding it in the place and controlling its shape. As we will see, the shape of the lens is important in focusing light on the light-sensitive layer of the eye. The iris, the colored portion of the eye that can be seen through the cornea, regulates the amount of the light that enters the eye. It is shaped like a flat doughnut. The doughnut hole is the opening through the center of the iris, called the pupil, through which light enters the eye. The iris contains smooth muscle fibers that automatically adjust the size of the pupil to admit the appropriate amount of light to the eye. The pupil becomes larger (dilates) in dim light and becomes smaller (constricts) in bright light. Pupil size is also affected by emotions. The pupils dilate when we are frightened or when we are very interested in something. They constrict when we are bored. 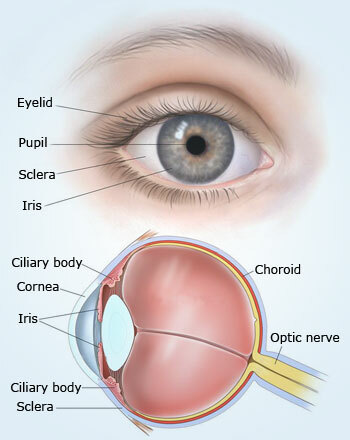 Anatomy of the human eye Notice that the sclera, the outer layer of the eye, becomes the cornea and that the choroid, the middle layer, is continuous with the ciliary body and the iris. The retina, the inner layer, contains the photoreceptors for vision; the fovea centralis is the region where vision is most acute. 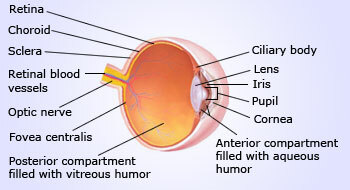 A drawing of a section through the human eye with a schematic enlargement of the retinaMuch of the construction of an image takes place in the retina itself through the use of specialized neural circuits. The innermost layer of the eye is the retina, which contains almost a quarter-billion photoreceptors, the structures that respond to light by generating electrical signals. Retina is similar to film in a camera. It receives light from an image we are looking at, and converts that light into electrical impulses which are sent through the fibers of the optic nerve to the brain. The optic nerve is mostly considered as the cable of nerve fibers which carries the electrical signals from the retina to the brain for processing. The point of departure of that optic nerve through the retina does not have any rods or cones, and thus produces a "blind spot". At the retina's center is an especially critical area called the macula, which enables us to see anything directly in front of us, like words on a page, a person's face, the road ahead or the image on a screen. 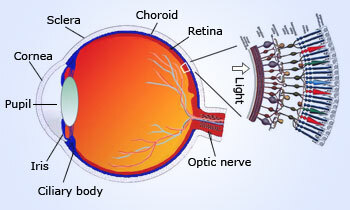 The retina contains two types of photoreceptors: rods and cones. The rods are more numerous than the cones and are responsible for our black and white vision. Rods are exceedingly sensitive to light and are capable of responding to light. The rods allow us to see in dimly lit rooms and in pale moonlight. By detecting changes in light intensity across the visual field, rods contribute to the perception of movements. The cones are responsible for color vision. Unlike the rods, the cones produce sharp images. The cones are most concentrated in a small region in the center of the retina called the fovea. Only the fovea contains a sufficient number of cones, about 150,000/mm2, to produce detailed color vision. Therefore, when we want to see the fine details of something, the image must be focused on the fovea. However, the fovea is only the size of the head of a pin. At any given moment, therefore, only about a thousandth of our visual field is in sharp focus. Eye movements bring different parts of the visual field to the fovea. The image formed on the retina is inverted. The brain rights the image as part of the interpretation. Retina to brain pathwayImage travels in coded fashion from retina to visual cortex at the back of the brain. How rods and cones work for perfect vision? The processing of electrical signals from the rods and cones begins before the signals leave the retina. The messages are first sent to bipolar cells, which begin to process the information, and then to ganglion cells. Between these two cell layers are horizontal cells and amacrine cells, which send signals laterally across the retina. Together, these cells convert the input from the retina into patterns, such as edges and spots. The bundled axons of the ganglion cells form the optic nerve, which carries the processed message from the eye to the brain, where the message is interpreted (Interpretation). The region where the optic nerve leaves the retina has no photoreceptors. As a result, we cannot see an image that strikes this area. This area is therefore, called the blind spot. We are usually not aware of our blind spot because the missing parts are automatically “filled in” as the visual information is processed by the brain. We analyze and understand the images registered inside our eyes because each and every bit of the image travels in coded fashion from retina to visual cortex at the back of the brain. The journey through the fibers of the optic nerves is complicated. 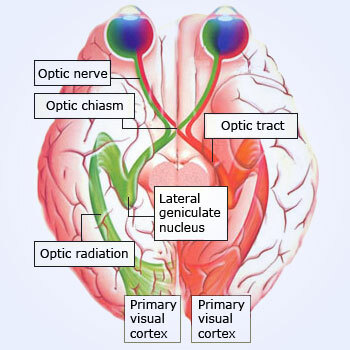 Nerves from each eye meet in the front of the brain at the optic chiasm. This is a partial crossing point where fibers from each eyes inner (nasal) side switch over to join the nerve-carrying fibers from the outer (temporal) side of the other eye. From the chiasm, both sets of nerve fibers now known as optic tracts continue through the brain. After passing the lateral geniculate bodies (relay stations in the thalamus for visual pathway), these nerve fibers fan out in the so-called optic radiation, ending at the primary visual cortex at the back inner edge of each cerebral hemisphere. The partial crossing of fibers at the optic chiasm ensures that signals from the right side of each retina reach the right visual cortex while signals from the left side of each retina reach the left visual cortex. Thus, all this intricate superstructure exists in retina. It translates light into nerve signals, allows us to see under conditions that range from starlight to sunlight, discriminates wavelength so that we can see colors etc. In addition to the three layers, the eyeball can also be divided into two fluid-filled cavities. 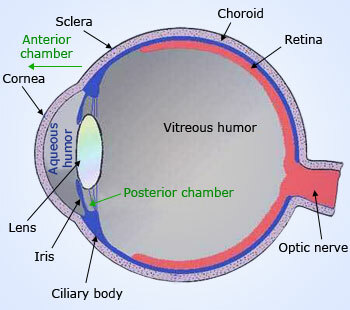 The posterior cavity, located at the back of the eye between the lens and the retina, is filled with a jelly-like fluid called vitreous humor. This fluid helps keep the eyeball from collapsing and holds the thin retina against the wall of the eye. The anterior cavity, located at the front of the eye between the cornea and the lens, is filled with a fluid called aqueous humor. This clear fluid supplies nutrients and oxygen to the cornea and lens and carries away their metabolic wastes. In addition, the aqueous humor creates pressure within the eye, helping to maintain the shape of the eyeball. Unlike the vitreous humor, which is produced during embryonic development and is never replaced, aqueous humor is replaced about every 90 minutes. It is continuously produced from the capillaries of the ciliary body, circulates through the anterior cavity, and is drained into the blood through a network of channels that surround the eye. If the drainage of the aqueous humor is blocked, the pressure within the eye may increase to dangerous levels. This condition is known as glaucoma. Light refraction In an eye of the right length, light rays are bent into a point of focus on the retina to achieve sharp vision. Sharp, clear vision requires that light rays be focused on the retina; focusing is accomplished by bending the light rays that enter the eye. Light rays are bent, or refracted, when the speed at which they are traveling changes, as occurs when they enter a medium of a different density. It is this bending of light rays that focuses the image on the retina. Because of the way that the curved cornea bends the light rays, the image created on the retina is upside down and backward. The most important structures in focusing the image are the cornea and the lens. Because the cornea is the only transparent structure of the eye exposed directly to air, more than 75% of the bending of light that enters the eye occurs here. But the cornea cannot make the adjustments needed to focus on objects at varying distances. Let's see how it manages further. Accommodation of eye When the eye is relaxed and the interior lens is the least rounded, the lens has its maximum focal length for distant viewing. As the muscle tension around the ring of muscle is increased and the supporting fibers are thereby loosened, the interior lens rounds out to its minimum focal length. The lens, however, is elastic, and its shape can be changed to focus on both near and distant objects by a process called accommodation. To understand how the shape of the lens changes, picture it as an underinflated round balloon. If you pulled on the sides of the balloon, it would flatten. When you released the tension, the balloon would assume its usual, rounder and thicker, thereby increasing the degree of bending in the light ray. In the eye, changes in the tension on the lens and therefore changes in the lens shape are controlled by the ciliary muscle. The lens is attached to the ciliary muscle by ligaments. Because the ciliary muscle is circular, its diameter becomes smaller when it contracts, much like pursed lips. This contraction relaxes the tension on the ligaments, and the lens is free to assume the rounded shape needed to focus on nearby objects. 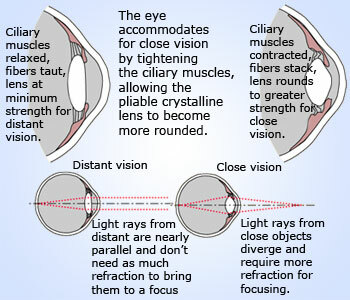 Relaxation of the ciliary muscle causes the lens's diameter to increase; this increase in diameter, in turn, increases the tension on the ligaments and the lens. 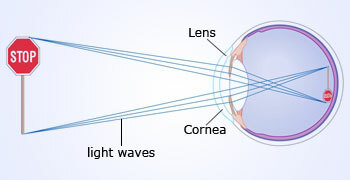 Consequently, the lens flattens and focuses light from distant objects on the retina. As we age, the lens becomes less elastic and does not round up to focus on nearby objects as easily, explaining why we hold the newspaper farther away as we become older. Human beings can perceive specific wavelengths as colors The reason that the human eye can see the spectrum is because those specific wavelengths stimulate the retina in the human eye. As we discussed earlier that humans are very visual creatures, but it may surprise you to know that the eye contains 70% of all the sensory receptors in the human body. The function of all photoreceptors, the rods and cones, is to respond to light with neural messages that are sent to the brain, where they are translated into images of our surroundings. Putting simply, let's take a moment to consider the process – “How vision works”. First, light waves in the visible spectrum (that is, wavelengths that our eyes can detect, 380 to 750 nanometers approximately) strike an object. 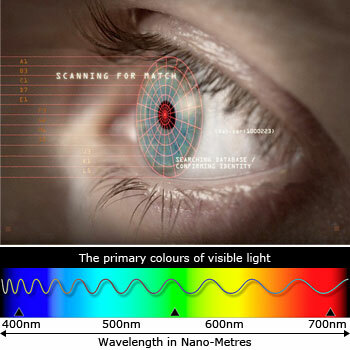 At least some wavelengths are reflected off the object to the retina of the eye. 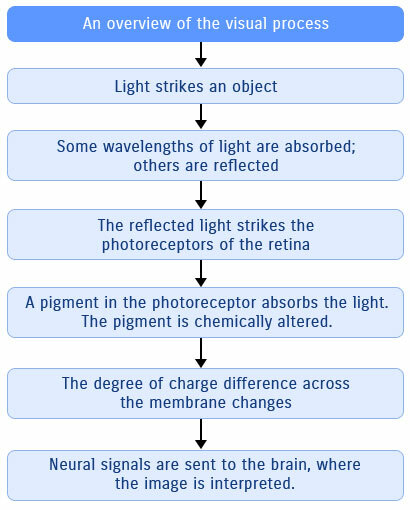 The light is absorbed by pigment molecules in the photoreceptors, causing a chemical change in the molecules. This change, in turn, changes the permeability of the plasma membrane of the photoreceptor, resulting in electrochemical changes in the receptor that initiate a neural message when they reach certain strength. The optic nerve carries nerve signals from the retina to the back of the brain, where the world outside takes shape. In a sense, then, seeing is an illusion, because there are no pictures inside our heads. The light-absorbing portion of the pigment molecules in all photoreceptors is a compound called retinal, which is bound to a protein called an opsin. 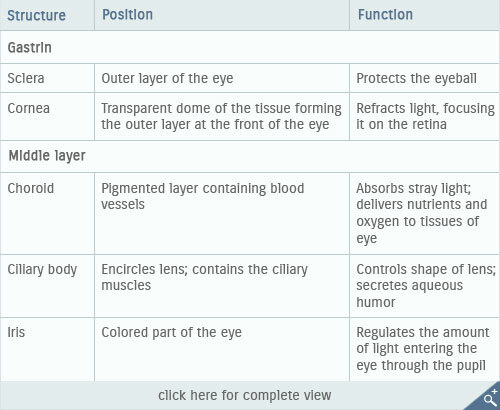 There are 4 types of opsins and thus 4 types of photoreceptors: rods and 3 types of cones. Retinal preferentially absorbs different wave lengths (colors) of the visible spectrum, depending on the type of opsin to which it is bound. The rods, you may recall, allow us to see in dim light, but only in shades of gray. The pigment in rods, called rhodopsin, is packaged in membrane-bound disks, which are stacked like coins in the outer segment of the rod. When light strikes a rod, the retinal portion of rhodopsin changes the shape and splits from the protein portion, which is called scotopsin. The splitting of rhodopsin triggers events that reduce the permeability of the plasma membrane to sodium ions, eventually leading to changes in the activity of bipolar cells and ganglion cells. In the dark, rhodopsin is resynthesized. That is why, it is difficult to see when we first walk into a dark room from a brightly lit area because the rhodopsin has been split. As rhodopsin is resynthesized, vision becomes sharper. Color vision When we look at a bowl of fruit, light reflected by a red apple stimulates red cones, light reflected by a ripe yellow banana stimulates both red and green cones etc. We see color because we have 3 types of cones, which are called blue, green, and red. The cones are named for the wavelengths they absorb best, not for their color. When light is absorbed the cone is stimulated. Each type of cone absorbs a range of wavelengths, and the ranges overlap quite a bit. As a result, colored light stimulates each type of cone to a different extent. For example, when we look at a bowl of fresh fruit, light reflected by a red apple stimulates red cones, light reflected by a ripe yellow banana stimulates both red and green cones, and light reflected from blueberries stimulates both blue and green cones. 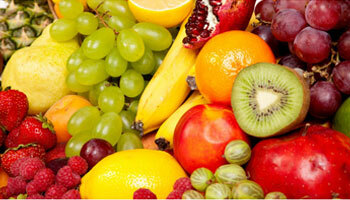 The brain then interprets color according to how strongly each type of cone is stimulated. Colorblindness is the condition in which certain colors cannot be distinguished. Most people who are colorblind see some colors, but they tend to confuse certain colors with others. A lack, or a reduced number of one of the types of cones usually causes the state of confusion.